Santa Barbara County's Fess Parker winery is branching out. In the spirit of their founder's pioneering ways, the heirs of the barrels are heading north, to the Napa Valley, to create a new label. It's not just a footnote, but an addition to the Parker legacy. Addendum is the company's arm for Bordeaux-style wines. 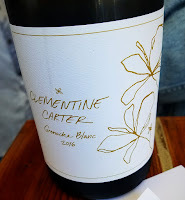 The Addendum wines will be available in September, but I was able to snag a sample thanks to a Brandlive virtual tasting event put together by Charles Communication. There's history there, as Kimberly Charles worked closely with Fess Parker years ago. She helped the world realize that the man could not only rock a coonskin cap better than anyone, he made a damn great bottle of wine, too. There's some nepotism there as well. Charles employee Greer Shull says she's a Parker family member, so this job hit pretty close to home for her. Parker's daughter Ashley Parker Snider, her husband and Parker President Tim Snider and winemaker Blair Fox all took part in the online session. Tim Snider says they felt they had to explore the possibilities presented by their vineyard relationships in Napa. In true pioneer fashion, they are blazing a new trail for themselves. Snider says the family did not make the move to producing Napa Cabs cavalierly. He says the main emotion at this point is enthusiasm. Ashley pointed out that they didn’t start a Cab label just so they could charge more for the bottles. Production on all four of the Addendum wines together is less than 800 cases, she says, so it’s more of a learning experience. Made from grapes grown in a "a prestigious Rutherford vineyard," this wine has what winemaker Fox calls "that Rutherford dust" all over it. It has California brawn, with an alcohol level of 14.9% abv. Aging took place over 28 months in completely new French oak barrels. It carries a price tag of $95. This wine is very dark in the glass. It gives off an unexpectedly subtle aroma of cassis and smoke. A whiff of graphite and leather come in after it sits a bit. The palate shows its youth, but in an endearing way. Slightly spiky tannins settle down with time, and the dark berry flavors just get more intense. There is some sweet vanilla in play, along with an easy little dash of cinnamon. The finish is incredibly long, and it's a pleasure to behold. The Spanish wine co-operative of Cellar de Capçanes reportedly made the first kosher wine in Spain. Importers Royal Wine Corporation says that Spanish Jews "were once one of the largest Jewish communities worldwide, living peacefully under both Muslim and Christian rule until the year 1492 when Isabel and Ferdinand expelled them during the inquisition. Currently, there are approximately 40,000 Jews living in Spain." The 2013 Capçanes Peraj Petita Rosat is a kosher rosé produced in the Montsant region of Spain. The wine is an incredible blend of Garnacha, Tempranillo, Merlot and Syrah grapes. It his only 13% abv on the alcohol scale, which makes it extremely drinkable. This wine colors up like cranberry juice. It has an extremely earthy and savory element to the nose. It's more than just an herbal "stemminess" - it's a full-on, nose-in-the-furrow dirtfest. There are cherry and strawberry notes, of course, but they live under the ground. The palate plays right along with the game, hiding its bright red fruit underneath an umami blanket. 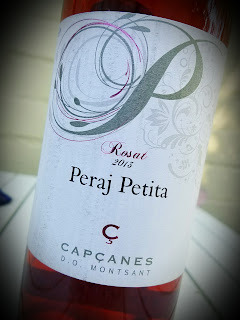 It's not an approach I find much in a rosé, even one that’s Garnacha-based. Nice acidity, and full in the mouth. Pair this with a salami sandwich, cashews or tapas if you're feeling adventurous. 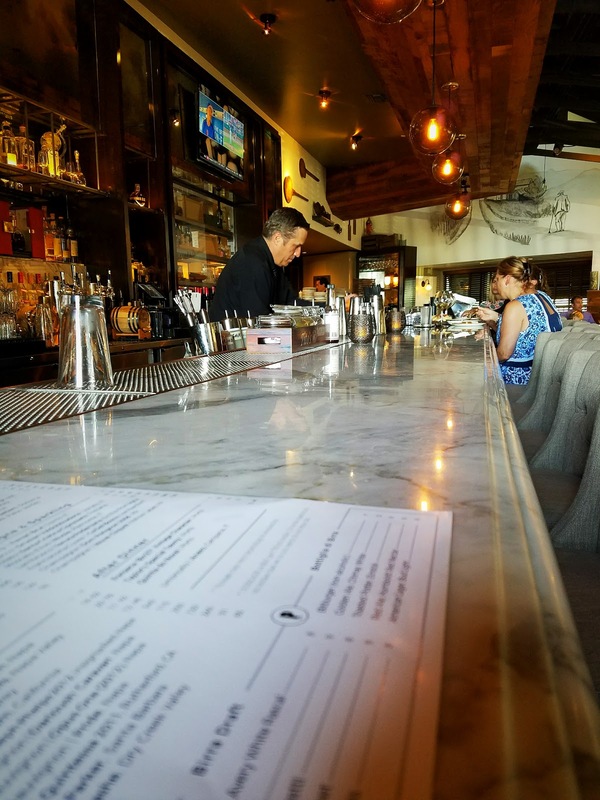 Oxnard may not spring to mind immediately when you start riffling through your mental Rolodex of California wine regions. The Ventura County town is home to Herzog Wine Cellars, under the umbrella of the Royal Wine Corporation. 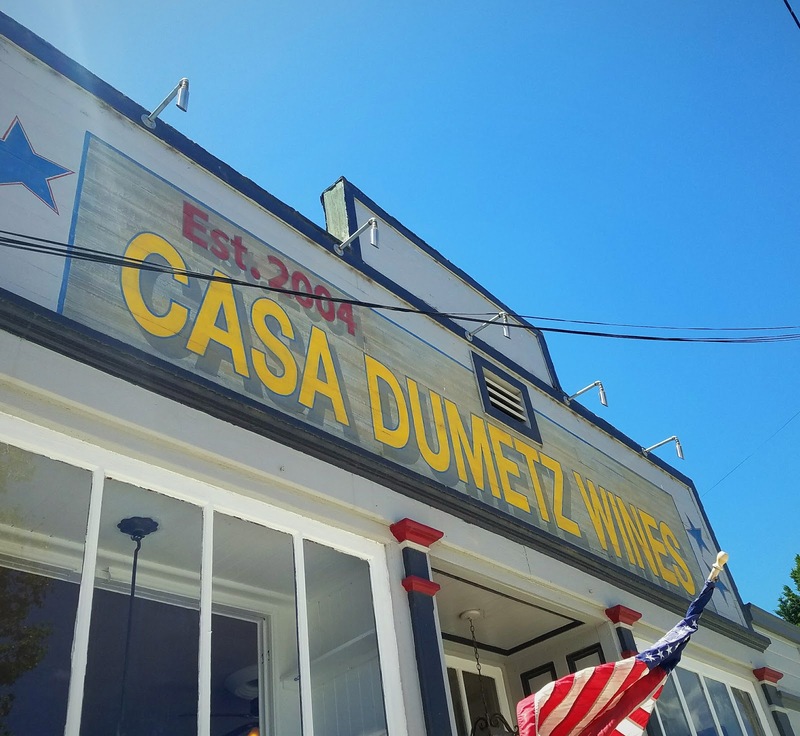 The winery's story is one of immigrant grit and determination. 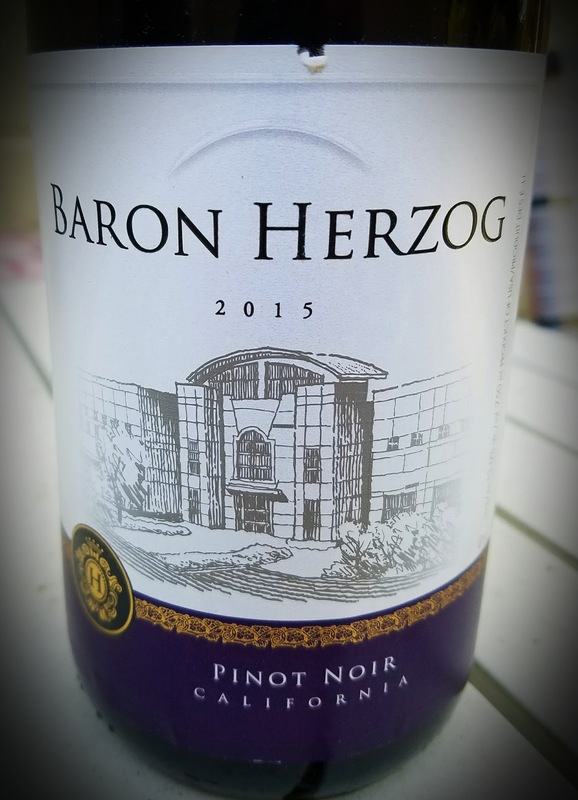 The Herzog website says the company goes back to "Philip Herzog, who made wine in Slovakia for the Austro-Hungarian court more than a century ago. Philip’s wines were so appreciated by Emperor Franz-Josef, that the emperor made Philip a baron." Philip's grandson Eugene had to move his family around quite a bit during World War II to hide from the Nazis, only to be run out of Czechoslovakia by the communists. 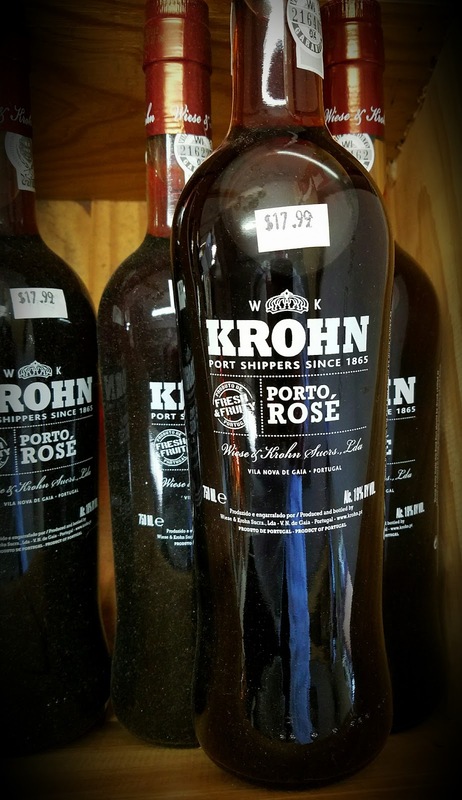 He brought his family to New York in 1948 and started working for a kosher winery that paid him in company stock. Within ten years all the other stockholders had given up on it, leaving Eugene as the last man standing. He and his sons then formed Royal Wines as a tribute to Philip. Expansion to Southern California happened in 1985, but it was a couple of decades before they would build their present state of the art facility. Head winemaker Joe Hurliman leads the kosher facility and produces wines in the tradition of the Jewish people. 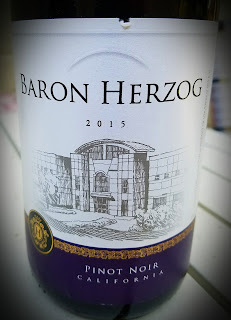 The 2015 Baron Herzog California Pinot Noir is a dark ruby in color, with light just barely getting through the glass. Its nose is straightforward - black fruit and a smoky layer on top. It's not terribly complex, but it is rather savory and pleasant. The wine is quite light in the mouth, which is surprising given the dark aromas. The tannins and acidity are both on the scarce side, leaving a Pinot Noir that is mainly just a sipper. Its light feel and rather thin flavor don't translate to elegance, so there’s not a lot to recommend it. 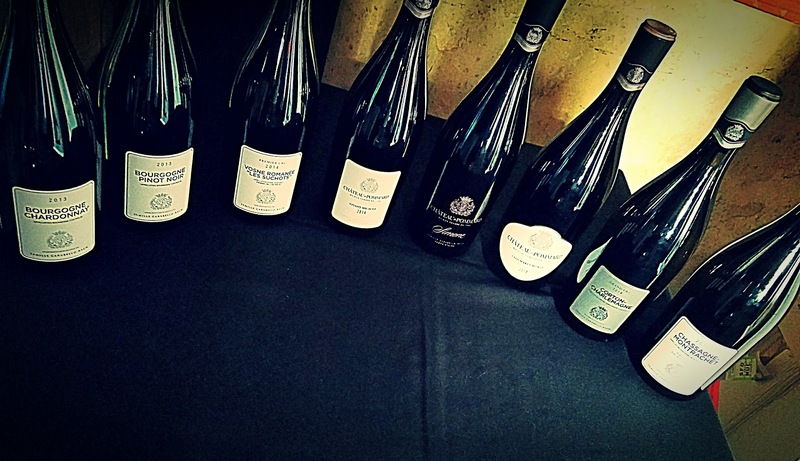 The Locations wines are an experiment of place for winemaker Dave Phinney, of Orin Swift fame. It's his attempt at making wine a country-wide effort. It resulted from a conversation he had with a French winemaker about what would happen if one were to simply break all the rules. Would something new arise? Would the wine world spin out of its orbit? Would people buy it? 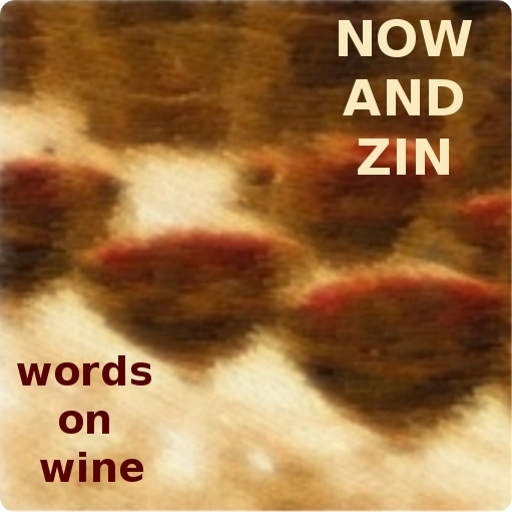 At first, I wasn't on board with the philosophy of making wine generically. I felt specific locations are important because of what they are, where they are, why they are. I still feel that way. However, after sampling through a few letters, I'm on board with what Phinney is doing. Yes, the letters. These wines are labeled only with a big letter or two, depicting the place of origin - E is for Espana, P for Portugal, I for Italy, TX for Texas. Yes, he sources grapes from Texas. 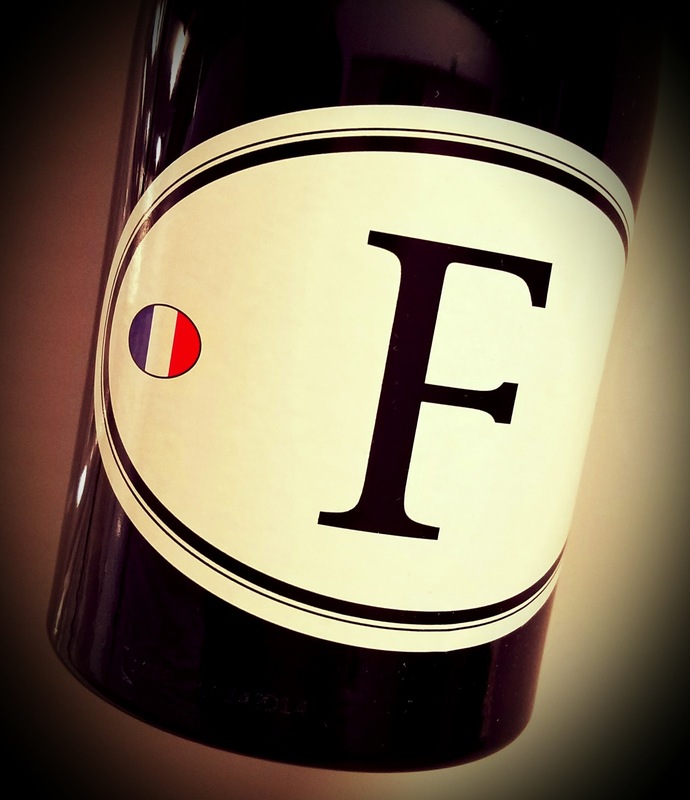 F is for France, and it's the fourth edition of the F series. The wine blends Grenache, Syrah, and assorted Bordeaux varietals into a heady - 15% abv - wine that comes on strong, then delivers. Ten months of barrel aging seems just about right for this letter. F4 is dark and jammy, with its heavy black fruit aromas mixing with vanilla, cigar and tobacco notes. The palate is big and rather boozy, with dark berries and plums walking hand in hand with savory, meaty, black olive flavors. Grenache, Syrah and Bordeaux varieties. How’s that for breaking rules? Italian wine producer Tenuta San Guido came to Southern California recently, to Torrance, in fact. 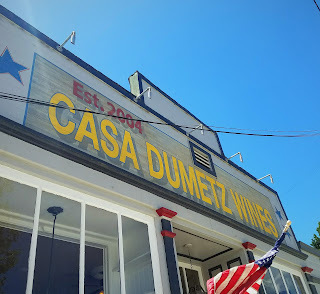 It was a great opportunity to reacquaint myself with the winery's tasty offerings and to discover a wonderful Italian restaurant in a neighborhood that is a little off the beaten path. Primo Italia's wine is looked over by sommelier Grace Giovannetti - her husband Lou owns the place. Their restaurant is only about eight months old, but is already a big hit with the locals, as the dining room was packed and the wine dinner was sold out. Rat-pack music is piped into the front room, while the wine event is held in a private back room by the wine cellar. The five-course Tuscan-style dinner from Chef Michelangelo Aliaga featured food that was farm fresh, homemade and wood-fired. 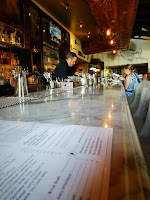 Chef Aliaga said, "Tuscany is a rustic, hunting area and these dishes are authentic." He served Florentine-style tripe, fish pancotto and pici pasta with hare ragu. The latter was two days cooked, with red wine. Venison with fruits of the forest was followed by grandmother's cake, "Torta Della Nonna." Tenuta San Guido is in the Bolgheri region of Tuscany, and they specialize in the so-called "Super Tuscan" style of wine which utilizes Bordeaux grape varieties, grown in Tuscany. The Marchese Mario Incisa was introduced to the wines of one particular vineyard near Pisa in the 1920s. He strove to create his own "thoroughbred" wine and used cuttings from that special place. It marked the birth of the Super Tuscan style.What the marchese called the "Nose of Bordeaux" comes from the gravelly soil in the area. He produced wines for two decades that didn’t leave the property. They were for private consumption only. 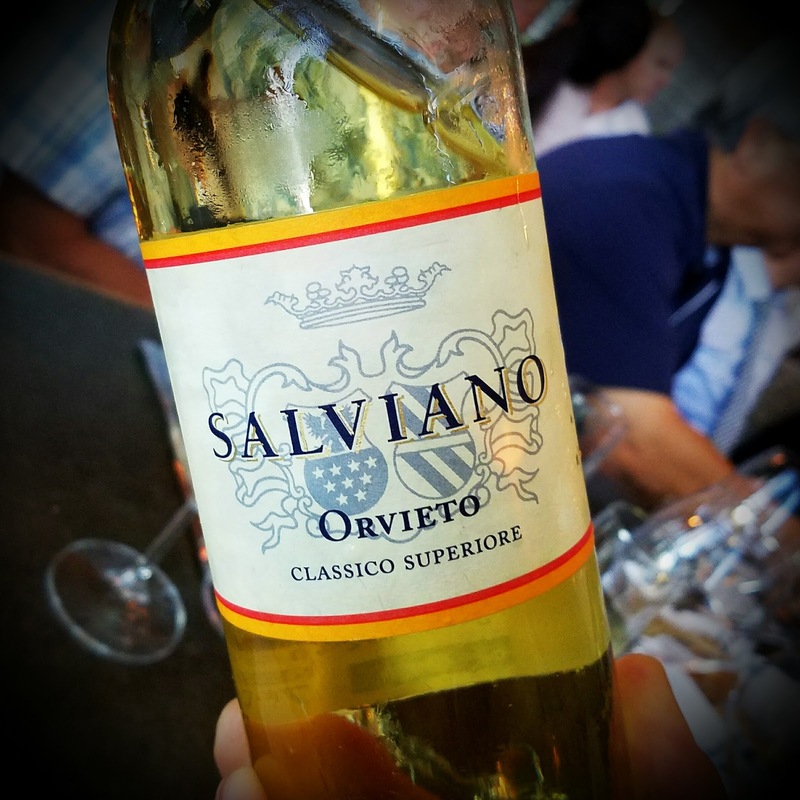 Salviano Orvieto 2015 - A pale gold wine from Umbria, the nose displays minerals, citrus and I swear I got seashore notes in this landlocked Italian white. Great acidity in the mouth, with lemon zest. It was wonderful with tripe and bread, although the acidity fought a bit with the spicy tripe. Grapes include Trebbiano, Grechetto, Chardonnay and Sauvignon Blanc. Le Difese 2014 - 70% Cabernet Sauvignon and 30% Sangiovese here. The nose shows roses, cassis and minerals, with a palate of black fruit, licorice and earth. Lovely acidity and tannins. It went well enough with the seafood stew, but I preferred the white. Guidalberto 2015 - 45% Cabernet Sauvignon, 45% Merlot and 10% Sangiovese grapes. Big red fruit, sage and eucalyptus aromas meet flavors of red fruit and soft tannins with an herbal note and finish. It was a great pair with the pici pasta. Sassicaia 2013 - 85% Cabernet Sauvignon and 15% Cabernet Franc grapes. Red fruit and minerals on the nose are joined by a bit of herbal note, white pepper and cedar aromas. The palate is smooth and rich, with savory minerals, quite elegant. It was remarked on by several around me at the table that it was hard to believe the wine was only four years old. Perfect with the venison. 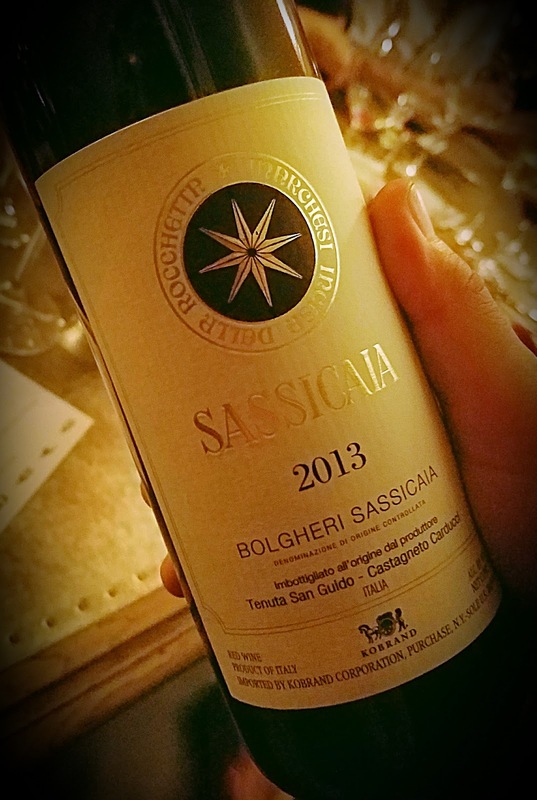 By the way, Sassicaia has its own appellation, Bolgheri Sassicaia D.O.C. 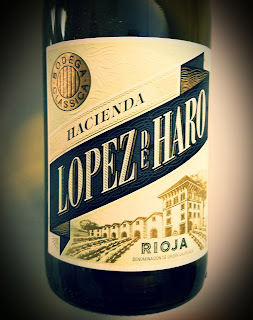 Hacienda López de Haro wine is made at Bodega Classica, in the Rioja Sonsierra region. The winery says it's in the heart of Rioja, with the Toloño Mountains to the north and the River Ebro on the south. Their vineyards - spread out over Rioja - average 50 to 80 years in age, some of them older than a century. The white Rioja wine contains Viura "and other varieties," as the winery coyly puts it. It hits 12.5% abv for alcohol and saw three months aging in French oak barrels. This white Rioja wine shows a pale golden tint in the glass. The nose is beautiful. Citrus and tropical fruit abound, with a stony minerality laced into the fruit. On the palate, the acidity is extremely refreshing and the flavors of tangerines and lemons are again presented in mineral fashion. The finish is lengthy and the tropical fruit seems to last the longest. Château de Pommard has been a Burgundy institution for nearly three centuries. 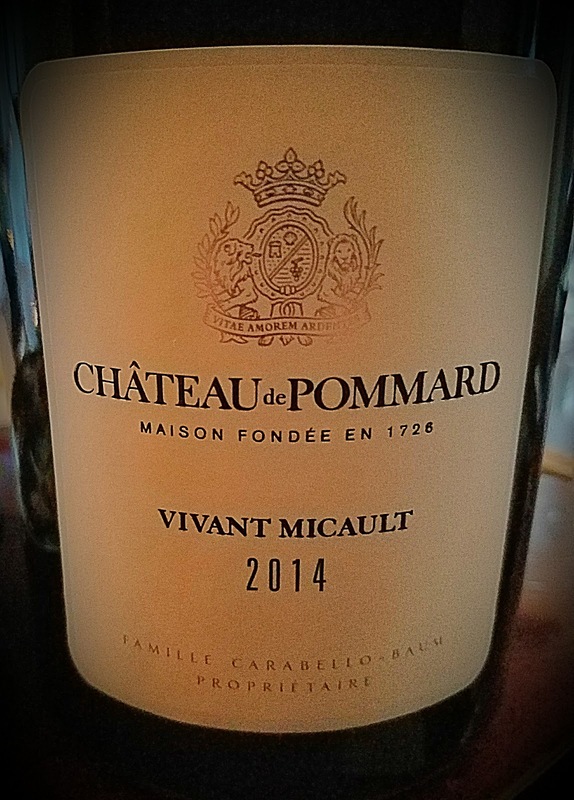 The Micaults, the Marey-Monges and now the Famille Carabello-Baum have all gotten dirty feet and purple hands in the vineyards and cellar of the domaine. 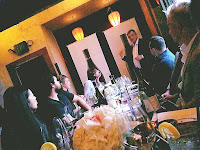 A recent dinner at L.A.'s Katana Robata introduced me to CEO Michael Baum and winemaker Emmanuel Sala, pictured. Baum's family are the first American owners of a wine-producing château in the Côte d'Or. They have brought a more open attitude to Burgundy from their California roots. They even had a music festival this summer, Rootstock. Baum didn’t come to Los Angeles to talk about tunes, though. 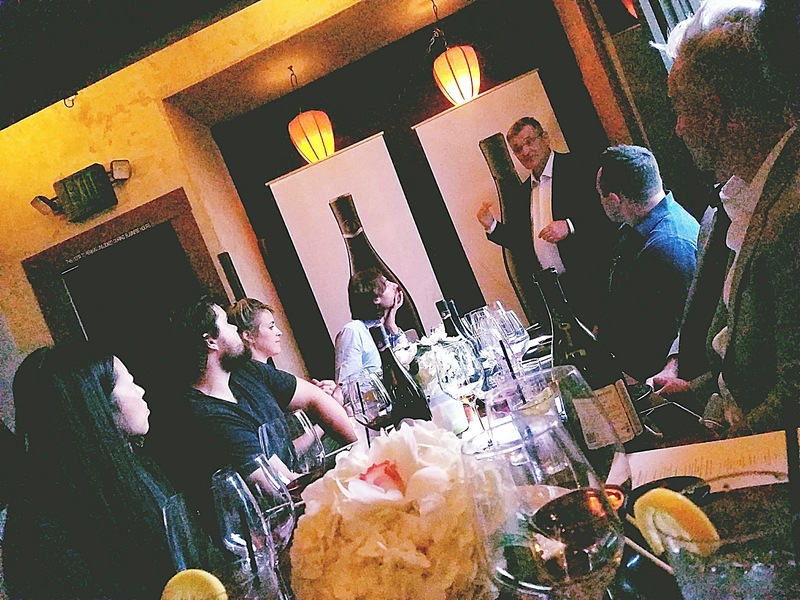 He came to talk about wine, specifically what his part of Burgundy is doing to educate people to the wonders of the region. Baum said Château de Pommard has launched six immersive wine experiences designed to "untangle the web that makes Burgundy the most envied wine region in the world." Bourgogne Chardonnay 2012 - Peaches and minerals grace the nose, while the palate shows nice heft with citrus and fresh acidity. 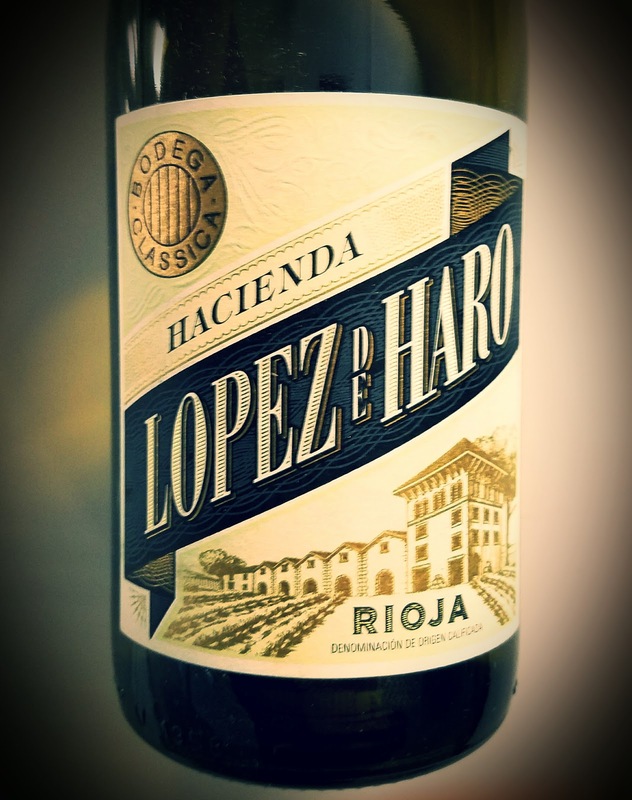 Made from grapes that came from 25-year-old vines, this blanc aged for 24 months in 15% new oak. Chassagne-Montrachet Premier Cru 2013 - Softer than the 2012, it pairs better with Asian dishes and shows more earthy qualities than minerals. Maranges Premier Cru "Les Loyères" 2013 - Medium ruby in color, this one has a gorgeous nose of soft black raspberry and tea. Very soft tannins make for an extremely elegant drink. It's as mellow as it gets, from a challenging vintage. Baum says, "To make beautiful wine, you have to like bad weather." The wine pairs perfectly with tuna carpaccio. Vivant Micault 2013 - From the oldest vines in the clos, there's black tea ahead of rustic minerals on the nose. A gentle structure is carried forward on the palate by an even stronger note of tea. It's a great pairing with shrimp tempura. Clos Marey-Monge 2012 - A very earthy nose full of black tea leads to a bit more tannic structure on the palate, but it’s still smooth. Raspberry, mineral and a bit of cola are notable. I found it reminded me somewhat of California Pinot, and it went well with spare ribs and pork belly. Simone 2013 - More cola notes come around on the nose here with the expected black tea and minerals. The palate showed the biggest of the evening's selections. Muscular, but still elegant. This was paired with the chocolate lava cake at dessert, and pleased the crowd. The venerable Jadot winery was established in 1859, but the family was digging around in the Burgundy soil a good 30 years before that. His Mâcon-Villages Chardonnay is ubiquitous. I'm convinced some people think Jadot is French for Chardonnay. 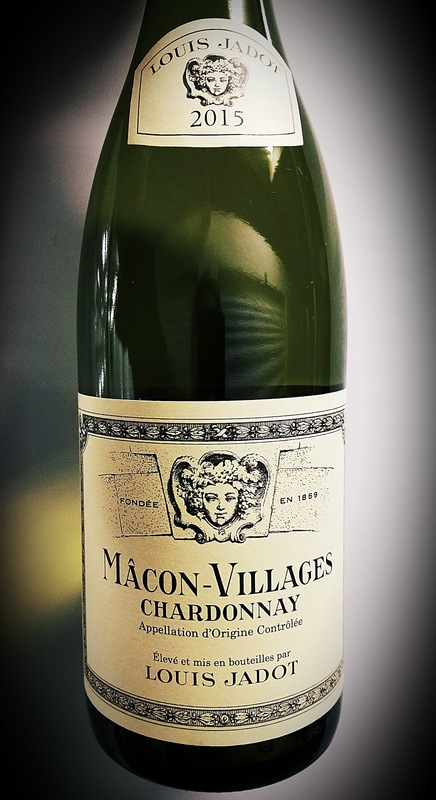 The Louis Jadot Macon-Villages comes from the Mâcconais region in the southern part of Burgundy, a place of limestone-rich soil, just made for Chardonnay. The Mâcon-Villages appellation consists of more than 40 different communes which provide grapes for the Jadot wine. The wine is predictably high-quality, 100% Chardonnay, vinified without the use of oak. Clean and lean, the citrus and mineral notes come through vividly. Refreshing acidity, only 13% abv. Drink up. 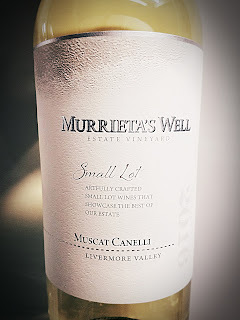 The Muscat Canelli grapes for this wine were grown in the Hayes Vineyard portion of the estate. The winery says that plot features a wide array of soils and elevations. The wine was vinified in stainless steel tanks, with five months aging in same. 2016 was the fourth drought vintage in a row for those grapes, and the concentration of the fruit shows the struggle the vines went through. Only 150 cases were made, at 14.2% abv, and they advise that a couple years of waiting will reveal a wine with even more body. The body it has right now ain't bad at all. It sells for $35. 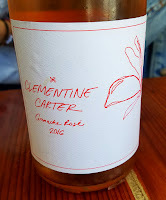 The wine comes on like a basket of flowers and Meyer lemons on the nose. The palate veers away from "sweet" and heads toward "minerals," though, with a nice streak of acidity ripping through it. Summer's here. Lobster, crab, oysters, bring 'em on. Beran owner and winemaker Joseph Wagner is a fifth generation California wine person, carrying on the family tradition passed down to him from his dad Chuck. 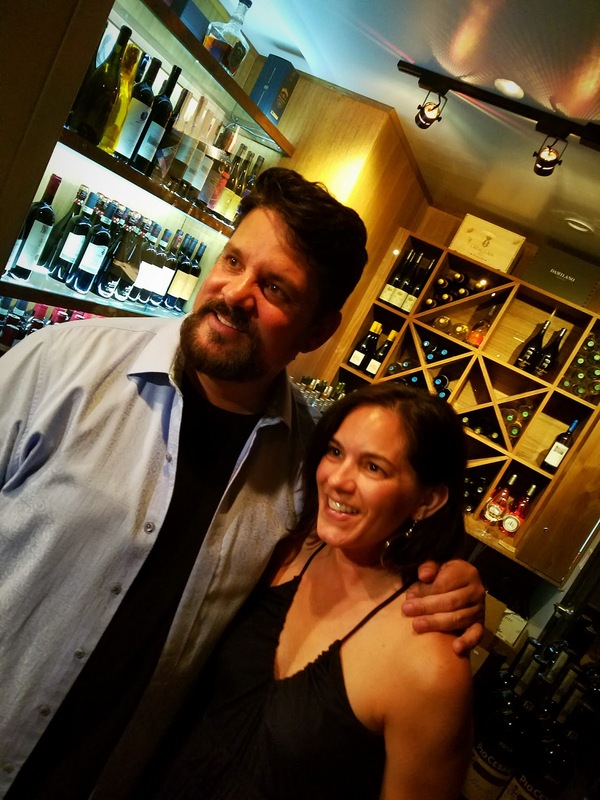 Already the originator of Belle Glos and Meiomi, his Copper Cane Wines and Provisions has that millennial ring to it. Beran is under that umbrella. Director of Winemaking John Lopez grew up knee deep in grapes, too. These grapes of California's heritage variety came from all over the Napa Valley. They were grown high on Atlas Peak and down on the valley floor in Calistoga. Some old vine Petite Sirah is in the mix, as well. The winery headlines its website with "Strength, conviction, Zinfandel." It’s a stance that Zinfandel drinkers appreciate, the ones who look at Zin the way Texans look at the Alamo. Aging took place in French and American oak barrels over the course of a year. The Beran's alcohol level is super-ripe at 15.4% abv, and the retail price is $48. 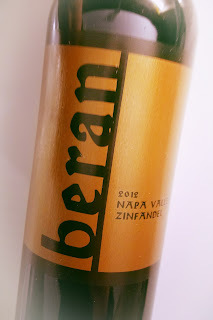 The Beran Napa Valley Zinfandel 2012 is inky black, with no light getting through at all. The nose is deep and black - blackberries, blueberries, cassis, tar, leather - it's rich. But when the sip hits the tongue it's amazing. That dark fruit gets a nice treatment from the oak and displays wonderful spice notes. There's more than just vanilla at work - pepper, cinnamon, cardamom, allspice, the whole rack fell into the cask, it seems. The tannins are plenty firm enough for pairing with grilled meat, but the wine, as if it is showing off, is smooth. A virtual event recently featured Murrieta's Well into an online tasting session, which is documented here. My thanks to Snooth and all those involved in putting on the show for inviting me and providing samples to taste. 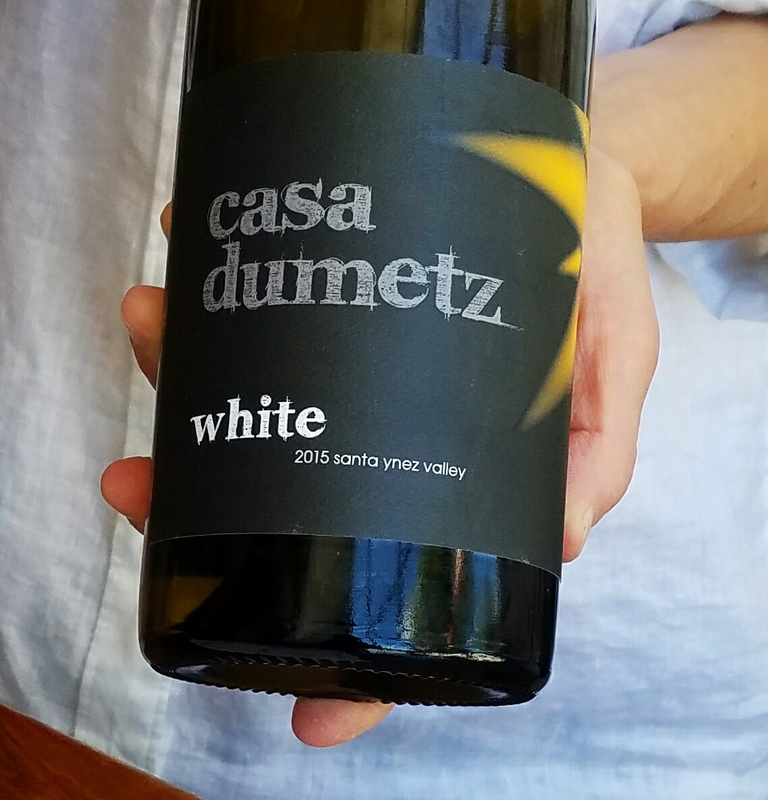 This white is 30% Sauvignon Blanc, 30% Semillon, 30% Chardonnay, 7% Viognier and a splash of Muscat Canelli, all grown in the Murrieta's Well Livermore Valley estate vineyard. The wine has 13.5% abv and sells for $24. They say they look each vintage for aromatics and food-friendly freshness. They certainly found them in this edition of The Whip. Here's what the winery writes about how the wine is crafted. 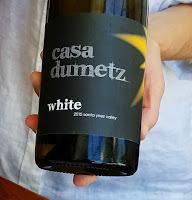 "A small portion of the Chardonnay and the Sauvignon Blanc were fermented in small oak barrels over the course of approximately two weeks to add a roundness to the blend. The remaining Chardonnay and Sauvignon Blanc, as well as the Semillon, Viognier, and Muscat Canelli were fermented cold in stainless steel tanks as individual components for approximately three weeks. This maintains the wine's natural acidity and vibrant freshness." The nose features a complex mix of honeysuckle, Meyer lemon and sweet peach. A stirring acidity frames citrus, minerals and nectarines in a food-friendly canvas that’s ready for spring and summer salads. If you’re snacking, it hits a walnut just right.